The following chart illustrates the training zones percentages of the composition of yards/meters training for a week of endurance swimming at the peak training period. Basic endurance training comprises the bulk of the training since it is not physically possible to train at anaerobic threshold day after day. It would be wonderful to train at Anaerobic Threshold (ANT) all the time but ANT training relies on muscle glycogen which is depleted in one-two days of ANT training. Since it takes time to rebuild your muscle glycogen stores, basic endurance training steps in and allows the body to recover glycogen stores while still training. This is completely dependent on your diet, but that is a topic for another article. Lactate Tolerance, Production and Power are all very minimal contributions since training too much above ANT decreases your overall ANT. The goal for endurance swimming is to maximize aerobic capacity or swimming faster with less reliance on anaerobic metabolism so lactic acid will accumulate at a slower rate and acidosis will be delayed. Lactic acid builds in the muscles during training, kind of like rust forming on metal, it restricts muscular contraction. Too much lactic acid buildup (acidosis) and you will hit the proverbial wall or bonk. Ideally an endurance swimmer will achieve a level of activity where the production and removal of lactic acid will be equal at their greatest speed. 3. Rest intervals: 30 secs – 2 min. Every endurance swimmer with a targeted goal OW swim should have a training plan laid out ahead of time to simplify training and mentally prepare them for the challenging road ahead. 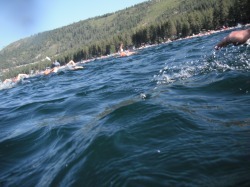 Done correctly OW endurance swimming training is not easy, but it is possible for all levels when properly planned. A basic overall plan for an 8K goal could be set up with a 12 week program including a 4 week base build. The 4 week base build would include 3-4 days per week of swimming at basic endurance training and build from 2000-4000 yds/m per swim session. The 12 week program would include 4-5 days per week and build from 4000-6000 yds/m per swim session and incorporate the above training concepts into each weekly workout. Each week will increase the overall volume by about 10% until the maximum desired weekly volume is achieved. The 12 week program would also include recovery weeks and taper weeks. The following graph illustrates the weekly yardage and the overall plan duration. For more information on suggested training, please contact Paul Fritz. Disclaimer: Please consult a physician before engaging in any physical activity. Never swim in open water alone, nutrition is a key factor not covered in this article. Training programs are best implemented through proper coaching and finally, consistent training is the key to success.